"Rock and roll is just a name for the music of the young spirit – of what is happening right in front of us. Something you can’t plan for. Something that you didn’t expect." A resolutely private artist who seldom looks back, Neil Young has never before unfolded his career on camera. With unprecedented access to one of the world’s renowned music legends, American Masters presents Neil Young: Don’t Be Denied premiering nationally Wednesday, June 10, 2009 at 9 p.m. (ET) on PBS (check local listings). The film explores how Young’s unbending dedication to the muse has created an awe-inspiring body of work and bruised a few egos along the way. Told in Young’s own words, the film weaves hours of exclusive interview, shot in New York and California, with previously unseen performance footage from the star’s own extensive collection. The documentary also features long-time collaborators Stephen Stills, Graham Nash, David Crosby, Nils Lofgren and James Taylor. In the 70s, Young wrote introspective songs on multi-platinum hallmark albums, After the Gold Rush (1970) and Harvest (1972). He became an emotional chronicler on the harrowing On the Beach (1974). With his signature falsetto and idiosyncratic guitar riffs, the crude collection of tracks reflected a bleak mood stemming from the Manson massacres and Nixon’s resignation during that decade. Following the drug casualties of his two confidants (Crazy Horse’s Danny Whitten and roadie Bruce Berry), he gave the music’s answer to cinema vérité: Tonight’s the Night (1975), a spine-chilling wake for his dead friends. By the end of the 70s, he reached his peak of popularity with critics and fans favorite, Rust Never Sleeps (1979). In the 80s, the rock veteran entered an experimental phase with hits and misses. Embracing the new waves of punk and electronica, Young teamed up with Devo on his art-house epic Human Highway (1982), a comedy film. Not one to stay static, he also released records exploring various genres including This Note’s for You (1988), a concept album criticizing the commercialism of the music industry. In the 90s, Young reunited with Crazy Horse and released the acclaimed album Ragged Glory (1990). Crazy Horse served as back-up band on Young’s solo release throughout the 90s. 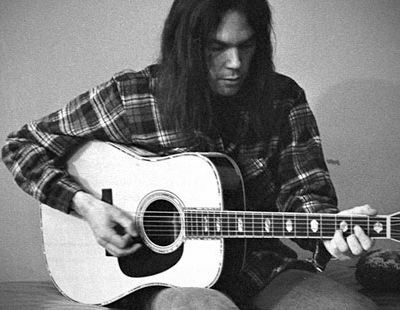 In 1995, Neil Young was inducted into the Rock and Roll Hall of Fame. More recently, Young promoted his Grammy-nominated, Iraq war protest album, Living with War (2006) on a Crosby, Stills, Nash and Young’s “Freedom of Speech” tour. The film ends with Young still refusing to be denied, playing an anti-Bush anthem to a Republican audience in the South. Neil Young: Don’t Be Denied is a production of the BBC. Ben Whalley is producer and director. Mark Cooper is the producer for the BBC. Susan Lacy is the creator and executive producer of American Masters. American Masters is produced for PBS by THIRTEEN. To take American Masters beyond the television broadcast and further explore the themes, stories, and personalities of masters past and present, the companion Web site offers interviews, essays, photographs, outtakes, and other resources. American Masters is made possible by the support of the National Endowment for the Arts and by the Corporation for Public Broadcasting. Additional funding for American Masters is provided by Rosalind P. Walter, The Blanche & Irving Laurie Foundation, Jack Rudin, The André and Elizabeth Kertész Foundation, and public television viewers.